The oldest capital of Cyprus is today a small charming town with an attractive little harbour, whilst innumerable archaeological areas exist throughout the whole town. Here, according to legend, Aphrodite, the Goddess of Love and Beauty rose from the water. This was her place of worship. Even the town's name is linked to the goddess, for Paphos was the name of the mythological daughter of Venus and Pygmalion. 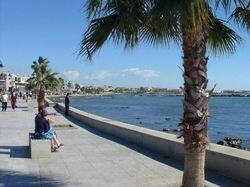 Paphos has an air of holiday charm combined with history and olden-day elegance. The upper part of town which leads to the shopping area is characterised by its classical style buildings, while the lower part - known as Kato Paphos has a life of its own. This part, down near the sea is the home of the harbour, the fish tavernas, souvenir shops and several beautiful hotels with important archaeological sites around them. 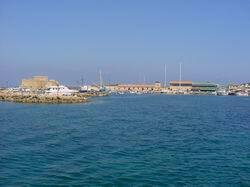 Paphos became the capital of Cyprus under the Ptolemies and its harbour became a busy, thriving port. Paphos history dates so back, further that the whole area is full of archaeological sites from different centuries. Start your visit with the museums. There is the Paphos District Archaeological Museum with a collection of Cypriot antiquities from the Paphos area. The Ethnographical Museum exhibits an interesting private collection of objects from the Neolithic Age to the present day, while the Byzantine Museum has a collection of objects from the Byzantine period, including Byzantine icons. Continue with the castles in Kato Paphos. The Medieval Ford was originally built as a Byzantine fort to protect the harbour. The castle of Saranta Kolones, also near the harbour, was built in the first years of the rule of the Lusignans. The Tombs Of The Kings is a wide area containing underground tombs carved out of solid rock dating from the 4th century BC - many decorated with Doric pillars. The amazing mosaic floors of the House of Dionyssos are considered among the finest in the Eastern Mediterranean. They mostly depict scenes from Greek mythology and are beautifully executed. End with the churches! Worth visiting are the church of Agia Solomoni, originally a Christian catacomb, St. Paul's Church, Panagia Limeniotissa Basilica, Panagia Chrysopolitissa Church and Byzantine Basilica and Theoskepasti Church. Most of these churches were built during the early christian years. Don't stop here! There are many more sites to see if you only travel just a little outside Paphos, to its surrounding areas. Visit the Temple of Aphrodite at Kouklia village, and dive to Petra tou Romiou where according to legend Aphrodite rose from the waves. Coming back to present-day religion, visit the two monasteries in the area: Agios Neophytos and Chrysorogiatissa Monastery.